Brazil has long been recognized as one of the powerhouses in Football worldwide. Brazil is well known for its stamina, skill and flair on the football pitch, usually leaving the rest of the world competing for second place. But far removed from these football certainties, (some Argentines may have something to say about it), is how well Brazil will fare in a newer contest now taking place across the business world — the contest to be the next location for offshoring of IT and business process services. Is Brazil a serious competitor in the “BPO/ITO World Cup”? Do they have what it takes to get to the final or do they face disqualification in the first round? The business of offshoring has been maturing for decades. Driven by strategies to reduce costs, generate economies of scale, and focus on core competencies, it’s clear that IT and business process outsourcing work. India has stood out as the pre-eminent force in this process; but in practice most global companies and offshore service providers are looking to spread their facilities and investments on a global basis, rather than in just one location. As a result, there’s keen competition to be seen as “the next offshore location.” And there’s no shortage of competing countries, ranging from China, Poland, the Czech Republic, Canada, Malasya, Russia, even Vietnam, Costa Rica and Jamaica. When searching for a suitable offshore location, client organizations need to scrutinize a comprehensive set of indicators, including labor costs and political, economic and social risks, among others. For Brazil to stand out as the “right decision,” it needs to provide a compelling answer to each of these points. Brazil’s proximity to the US makes it distinctly more accessible than more distant Asian locations. It therefore qualifies as a “nearshore” location for the US market, along with Canada and various Caribbean countries. Brazil is cheaper than almost all other South American or European countries, with a 30% salary advantage cost over the US. However it is not the cheapest option, with Indian locations benefiting for an additional 30% cost advantage. The average salary for an “entry level” IT worker is about $9,000, while in China and India it’s about $5,500. However, one needs to take a closer look at final project costs to understand that most likely, the overall cost may be much more effective when comparing to other Asian destinations. Brazil is has become very competitive under the “ELC – End Loaded Cost” view, where several components not initially included, need to be accounted for. Such as rewriting costs, travel and transportation costs to adjust project changes, high turnover, etc. Elected in 2002, President Luiz Inacio Lula da Silva has been showing his eagerness to attract foreign investors. The government is keen to contribute to the development of Brazilian offshoring, with a target of $2 billion for IT services exports by 2009 (compared with $800 million in exports today).While security still remains as big concern in the largest cities like Rio de Janeiro and São Paulo, other IT hubs have developed in Brazil, such as Campinas, Belo Horizonte, Porto Alegre and even the capital Brasilia. Other great improvement promoted by the federal government, are the social programs that have been effective to attack social inequality. Today the economy is stable, with a 4.5 % inflation rate at the end of 2007. The IT sector itself is a well developed $16 billion market, with a $10.2 billion multinational presence. But what is most striking about the Brazilian economy is how diversified it is. It is not only commodity based, Its strength comes also from other industries such as automotive, aviation, energy, industrial machinery and finance sectors, just to mention a few of the most important ones. This translates into business acumen, which in turn means greater business expertise provided to its offshoring capabilities and competitive advantages in applications development and maintenance. 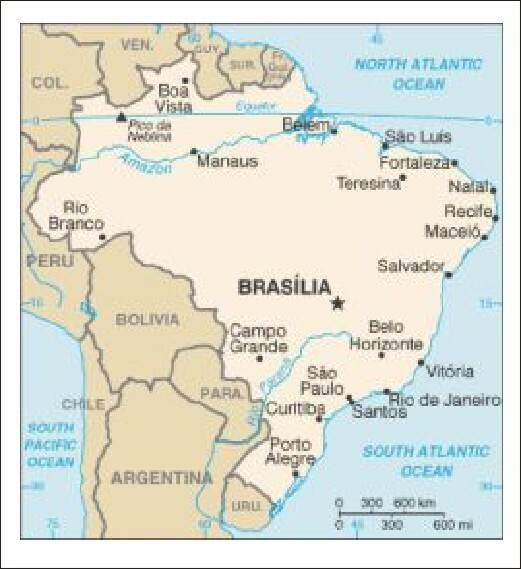 In the only South American Portuguese speaking country, English is the second language most spoken in the country. However, it still lags in the amount of IT professionals that are English proficient and that can actually “talk turkey”. Currently government and industry trade have deployed several training programs to develop more English speaking skills among the IT professionals. Brazil is considered the most mixed race on the planet according to a study conducted by The Global Review Institute in 2006. An odd piece of trivia actually comes to prove that: – The Brazilian passport is the most expensive passport in the black market, as anyone can pass for a Brazilian. How this translates into the outsourcing arena: it makes the Brazilian culture a boundary less one. Meaning that, cultural traits will not come into play, when negotiating and adjusting the projects become mandatory. The cultural diversity, added with past background, where most Brazilians found themselves fighting adversity, has created a special kind of acute work ethics, that in some of the presentations made to showcase Brazil as a viable outsourcing destination, has been labeled as the “Cultural DNA Competitive Advantage”. This Cultural DNA has actually been illustrated with a half true half fiction story about a great pizza shop in the North Beach District of San Francisco, where you find the best thin and crispy pizza in the west coast, owned by the Greek John. But it is not only the taste and quality of his pizza that astonishes who gets to learn his story. He also holds the record for the amount of daily pizzas delivered to the entire bay area of San Francisco. Most people, find this fact quite astonishing, as John owns just one little shop, while Pizza’s Hut and Dominos Pizza’s franchises are scattered all over the place. Yet, John manages to deliver more pizzas then the other two. As one of his frequent patrons, one day I decided to inquire what was his great secret that enabled him to set such a record. He told me that, what really made that happen, was that he had a very tight, top notch delivery boys team, all on motorcycles. That made me very curious and I asked him where did he find these guys? How did he hire them? To which he responded that he had only one criteria for hiring the motorcyclists: Be Brazilian. That, to me, was much more mind boggling that the record itself, so I asked why. He responded that the Brazilian motorcyclists provided three key success factors to his business, and that in turn, made him the top pizza delivery shop in the Bay area. One: – Business Expertise. If they can drive those motorcycles like they do in São Paulo, they can drive them anywhere else in the world. Two: – Flexibility. He could count on them for everything and anything. They were not tied to a 9 to 5 job, or stuck to a job description. They were committed to getting things done, whatever it takes. Three: – Reliability. He could count on the delivery boys to get the pizza delivered in time, no matter what unforeseen event came up in the front line. “They don’t bring me back a problem, they just tell me what solution they gave. Now, aren’t these three critical success factors: business expertise, flexibility and reliability the same when it comes to outsourcing IT services to an offshore destination? Brazil has been showing signs of becoming a serious contender in recent years. Aware of the opportunities of tapping into offshore demand, in 2004 the big national players in the IT service industry in Brazil (CPMBraxis, Datasul, DBA, Itautec, Politec and Stefanini) created BRASSCOM with the main objective of promoting the export of IT services among its current roster of 3,265 IT firms. At the same time of the creation of BRASSCOM, the Brazilian government upgraded its promotional program via Softex, and created several Vertical fronts, one of the being the Outsourcing Vertical, and since then, has participated in all of the major outsourcing corporate events promoted by Gartner, United Business Media, Forrester and others. Most Brazilian companies participate in these efforts and have been able to leverage several new business opportunities. Last September, at the Mid Size Enterprise Summit, in Dallas, a matchmaking high profile executive event, Brazil-IT, the brand used to promote the best of breed Brazilian companies, won the Innovation Awards in the category of Best Services Offering, coming to prove that there is an upgrade view on what exactly the potential of the Brazilian companies is. As proof of concept for this approach, CPMBraxis was not too long ago, awarded a $7 million outsourcing contract with a major European bank. At the end of 2005 Stefanini became the first Brazilian native company to achieve Capability Maturity Model Integration (CMMI) Level 5 certification. The global outsourcing service providers and software firms have a strong presence in Brazil and many are already serving their global client bases. Companies such as IBM, Unisys, HP, EDS, Accenture, Deloitte, Motorola, Intel and Nokia all have offshore centers in Brazil. In addition, TCS, the largest of the India offshore players, has plans to create a new global development center in the state of Sao Paulo, in addition to an existing center in Brasilia. As the offshore market continues to evolve, Brazil appears to be well placed to compete. It won’t provide the lowest prices, but in an increasingly sophisticated marketplace, this is no longer the only assessment criteria. Brazil has a mix of capabilities that, in particular, position it to provide nearshore services to the US. Brazil also has the beginnings of a track record in ITO and BPO, as it draws from its deep business acumen from the more than 30 industry segments that make for it strong economy and GNP performance. It appears unlikely they’ll ever displace the current market leader, India, but by the time of the next World Cup in 2010, Brazil may well be one of the leading runners up. I really blog also and I am writing something comparable to this particular article, “Brazil as an outsourcing destination | Brazil Exports IT”. By all means. One of the reasons to blog is to share and transform. Would like to read when done and perhaps also link it back to something we comment.